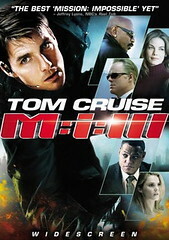 Mission Impossible III (aka M:i:III, or as I like to say it: Capital M, colon, lowercase i, colon, roman numeral three) starts off pretty gruesomely. Tom Cruise is handcuffed to a chair, being interrogated by a very menacing villain (the versatile Philip Seymour Hoffman) who is holding a gun to Tom Cruise’s wife. Then, while Tom Cruise watches in horror, Hoffman shoots the wife in the leg and then in the head, killing her. Then the opening credits roll. Now isn’t that nice? Maybe I’m getting too wimpy in my old age, but scenes like this really freak me out. I hate them. They’re too painful to watch. I cringe when I’m forced to watch a man desperately trying to save his wife’s life, begging, pleading, working any and every angle to keep her from being killed. And then boom! All for not. You’ll be happy to know, however, that once the initial scene is over, the gruesomeness eases up a bit. This isn’t Saw or any of its sequels, films that I believe are perpetuated by the devil himself. It’s an action movie. And a dang good one at that. OK, I’m going to go out on a limb here, but I don’t think Tom Cruise is crazy. I think he gets far more bad press than he deserves and is probably a rather decent person. One doesn’t get to the position of power he holds by being an idiot. Yes, Paramount dumped him. But someone else scooped him up lickety split, possibly giving him even more power than he held before. And I don’t care what anyone says, Tom Cruise is a fine actor. He’s handsome, charming, a movie star, pure and simple. So he believes in Scientology. So what? So he has a reputation of being an egomaniac. So what? The man entertains me when he’s on screen, and that’s all that matters. Top Gun? Priceless. Rain Man? I cried. Days of Thunder? Well, let’s skip Days of Thunder. He’s a fine actor. And Mission Impossible III is no exception. He’s a thrill to watch. As was Hoffman. The man can disappear into any role. He can be hilarious one minute, like in Along Came Polly, and then exude pure evil in roles like this. Here, his villain was so ruthless, so unabashedly evil, that he scared me silly. When he made threats, he did so so matter-of-factly, so brazenly, that I believed every word of them: He was going to kill Tom Cruise. Kudos also goes to first-time feature film director J.J. Abrams, creator of my favorite TV shows Alias and LOST. And in truth, Mission Impossible III felt like a bigger, louder, more-things-blow-up episode of Alias. The similarities are almost uncanny: there’s a secret government agency, one that prohibits its members from divulging their involvement to their spouses. There’s lots of fancy gadgets and people in disguises. There’s trips around the globe to exotic locations. There’s repelling, shooting, many conversations via walkie talkie and lots of near-death experiences. There was even a Marshal character (the computer genius geek on Alias) coming to Tom Cruise’s rescue via a phone line — which happened on nearly episode of Alias. But I didn’t mind. I love Alias. I love the whole covert, black-ops story line. I’m a sucker for that stuff. So I enjoyed this film immensely. The stunts were amazing — and to think that Tom Cruise performed some of them made them even more amazing. A must watch if you can stomach intense action sequences.